It’s October, and here the days are getting shorter and the nights longer. Even in our warm climate our foliage is responding to cues to slip into dormancy and my cats are working on their winter coats. As the holiday season nears, it’s time to dial it down a notch, kick back and enjoy a somewhat more relaxed, contemplative pace. NOT! I’ve got way too much going on. I’ll be staffing a booth during this virtual convention on Epic Wednesday, Nov. 4. This will be a dedicated Facebook page. I hope you’ll come visit, comment, participate in the contests and giveaways. I’ll be on a panel with five other authors of various types of fantasy books including paranormal and dystopian romance. We’ll be chatting about The Hero’s Journey but since all the panel members are women we’ll likely focus more on The Heroine’s Journey. We’ll raise some provocative issues and possibly some hackles, too. NaNoWriMo begins Nov. 1. I’ll be endeavoring to write 50,000 words in 30 days which will be about 200 pages of a planned detective story. This will be my 5th writing marathon. I’ve managed to meet the challenge every time, sometimes with only minutes to spare. Can I do it again? I began The Redoubt, Book 4 of The Bewildering Adventures of King Bewilliam, during NaNoWriMo 2014. A finished draft is in the hands of beta readers now. Though I didn’t expect to hear their comments until the end of October, one reader found it un-put-down-able and has already sent back her green-light review. So I’ll be working to finalize this book, slated for a February, 2016, launch. 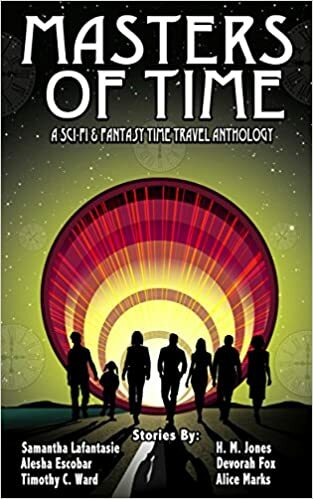 This anthology of time travel stories which includes my “Turning the Tide” continues to delight. Would that I truly was a Time Master. I could get myself rolling on several simultaneous timelines and meet all my challenges before I run out of you know what. So do invite me to your holiday party. Just don’t be surprised if you find me snoozing under that pile of guests’ coats. This entry was posted in arts&crafts, events, read and tagged arts&crafts, events, fantasy, read, science fiction, time travel. Bookmark the permalink.